This prophetic quote comes from the correspondence I had with author Peter Cohauz when I was trying to help him sort out the identities of these two Me-109s back in November 1999. I had written a small and modest report on the subject and felt rather satisfied with my handy work until new information came to light and I found out just how prophetic Peter�s words actually were! Feeling a need to amend my previous report, I decided to go back to my research to see what I could come up with. Uncovering any facts in this case has been far from easy. We are dealing here with aircraft that are over 55 years old and have been through many owners. Neither machine can be considered a �pure� restoration as they have both been heavily cannibalized with spare parts from other aircraft to make up a complete airplane. Data plates turn up missing, official records, if they exist, are rare and hard to come by, memories fade with time and what little information has been made available to the general public is often conflicting. In my determination to find the facts and resolve the controversy, I�ve made many new friends and probably just as many enemies, but I feel I have uncovered enough information to present a good case here. But of course, that is for the reader to ultimately decide. I. A Case of Recycled Aircraft. There are those who contend that all Me-109 G-10s were built new at the factory. Where this might be true for Me-109 K series that followed the G-10, or of Luftwaffe aircraft in general, it does not explain why both 610824 and 610937 have two manufacturer�s data plates attached to the fuselage. Many wartime photos seem to show this and sources indicate that this is a sure sign of older, existing aircraft being rebuilt to G-10 standards. By October 1944 when the G-10 first appeared, the Reich was being systematically pounded into rubble by the Allies �round the clock� bomber offensive. Everything was in short supply. Raw materials were dwindling, fuel supplies were running out, transportation of any kind had broken down and factories were forced to disperse into the countryside with all the usual bottlenecks in production associated with such a move. Yet in 1944, Germany produced more fighters than in any other year of the war. Given the conditions at the time I feel that this feat could only be accomplished by recovering repairable airframes and re-manufacturing them into new fighters with the latest equipment upgrades. 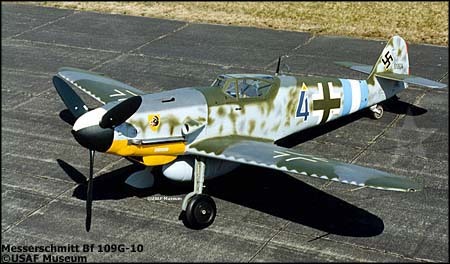 Indeed, the goal of the Me-109 G-10 program was not a further development of the G series, but an attempt to convert older, repairable aircraft such as the G-6 and G-14 to a standard of performance roughly equal to the K-4 that was still under development. My best example of this practice is the Erla Machinenwerk GmbH of Leipzig who had been building the Me-109 under license since 1937. Ingenieur Fritz Bartsch, a long serving staff member was tasked to organize a Reparturbetrieb (a large scale repair depot) in Belgium. The site selected was the old Minerva automobile works at Mortsel, a suburb south of Antwerp, located near the Deurne-Antwerp Airfield and conveniently close to a railway siding. Civilian workers and contractors willing to work for the Germans were found, the necessary tools and machinery brought in and from 1941 until the Allies were literally knocking on the front door with the Germans quickly exiting out the rear, Frontrepartutbetrieb GL Erla VII was an ongoing concern. Trainloads of damaged Me-109s arrived at this depot and were quickly stripped down and overhauled. The latest modifications were incorporated during repairs along with the latest Umrust-Baustaze (factory conversion sets) and then the refurbished aircraft were repainted, test flown and delivered to front line units. All of this activity didn�t escape the notice of the Allies and Erla VII did become a victim of a rather abortive bombing attempt by U.S. forces on April 5, 1943. Little damage was done and Erla VII was used for series repair of the Me-109 until September 1944, when they were forced to retreat in the face of advancing Canadian forces. From there, they set up shop in Munster until the end of the war. Although most of this story happened before the Me-109 G-10 entered service, I feel safe in saying that the German aircraft industry continued this practice until the war�s end. II. G-6, G-14 or G-10? Along with the identities of 610824 and 610937, there seems to be a bit of confusion over what model of Me-109 G they actually are. I have seen 610824 listed as a G-6 and 610937 listed as a G-14. I�m not sure if this is a case of mistaken identity or publications stating what the aircraft were originally before being re-manufactured into G-10s. 610824 was rebuilt from a G-6 fuselage. Although the original manufacturer�s data plates were removed prior to its being restored, a fuselage sub-assembly plate was found inside the aircraft showing that it was a G-6 fuselage. This information was passed along in the restoration process, but unfortunately the information on the plate was never recorded. The original data plates for 610937 were intact however and show that this machine was rebuilt from a G-14, werke number 127914. Photographic evidence shows all the trademarks of the G-10 series. The refined cowl bulge, larger supercharger intake, the larger Fo-987 oil cooler, larger tires and corresponding wing bulges. The DB-605D engine and characteristic chin bulges certainly disqualify the G-6. Not even a G-6/AS would exhibit all of these features. Messerschmitt Me-109 G-10/U4. Wk. Nr. 610824. Civil Registration: N109MS. Remanufactured from a G-6 fuselage (wk. nr. unknown) in 1944 by WNF. Known as �Black 2� of II/ JG 52. Surrendered at Neuibiberg, near Munich in the group�s en masse retreat to escape Soviet forces. This machine was one of three Me-109 G-10s taken to the U.S. by Capt. Fred McIntosh, in charge of collecting piston engined aircraft for �Watson�s Whizzer�s�. After test flying, it was found not to be airworthy and made its journey to Cherbourg by truck, it was then loaded on the aircraft carrier H.M.S. Reaper along with many other captured Luftwaffe aircraft and left port on July 19, 1945. 12 days later it arrived at pier 14 in New York Harbor, it was trucked to Newark, New Jersey and finally arrived at Freeman Field near Seymour, Indiana on May 17, 1946. The aircraft was given a rather spurious paint scheme and the code: FE-124, this was changed later to: T2-124 when the Air Technical Service Command underwent re-organization and the Technical Data Laboratory Branch became part of T-2 Intelligence. With the end of World War Two, non-critical facilities like Freeman Field, which was being used to store surplus Axis equipment were being closed down and aircraft that weren�t earmarked for museums were to be scrapped. This probably would have been the fate of T2-124 and T2-118 had it not been for the interest of Professor Donnell W. Dutton at the Georgia Institute of Technology in Atlanta. In 1947, T2-124 and T2-118 were donated to Georgia Tech. The two airframes were not used officially by Georgia Tech. For research or evaluation, but were placed in storage for later display by the school�s nine member flying club. Sometime around 1955, Bud Weaver, an FAA inspector in Atlanta traded a working aero engine for the two aircraft. They were then stored out in the open at various rental properties owned by Mr. Weaver and soon became derelict due to vandals and exposure to the elements. It was at this time that 610824 lost its original wings. Someone had the local Trash Company haul it off to the dump! Mr. Weaver arrived in time to retrieve the fuselage, but it was too late to save the wings. If anything good could have happened from all this, then at least the weather had worn off the spurious paint job to reveal the original markings on what was left of the airframe. 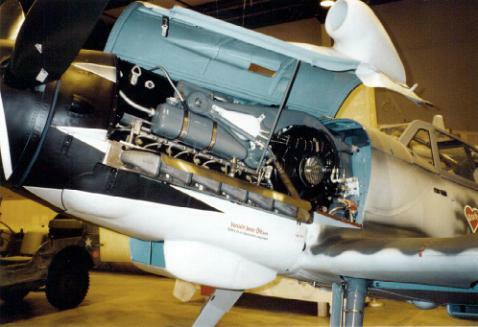 In the mid-1960s T2-124 and T2-118 parted company as John W. Caler of Sun Valley, California Valley purchased the remains of the Me-109. His intentions were to restore the aircraft (in his own garage!) and he was able to obtain a set of wings from a Czech Avia. He reportedly tried to re-skin the fuselage and because of a lack of proper tools and expertise, the results were not a professional looking job. This is supposed to be a clue to 610824�s identity. This project was eventually abandoned and the airframe sold to an unknown private collector, date unknown at this time. Somewhere between 1979 and 1984 it was sold to Doug Arnold�s Warbirds of Great Britain Collection and placed in storage at his Biggin Hill facility to eventually become a stable mate with our other Me-109 G-10, wk. nr. 610937. Some restoration work may have been carried out but cannot be confirmed. In 1989 it was sold to Evergreen Ventures and restored to static display condition by Vintage Aircraft Restorations LTD. of Ft. Collins, Colorado. Depending on which source you want to go by, restoration work was completed in 1995-1997. Since April 1, 1999, 610824 has been on display at The United States Air Force Museum at Wright-Patterson AFB in Dayton, Ohio as �Blue 4� of JG 300. An interesting side note here: As Freeman Field was a subsidiary of what was then known as Wright Field, it would seem that 610824 has traveled full circle since its arrival in the U.S. in 1946. *For the full story of the Fw-190 D-13/ R 11 known as T2-118 read: Eagle Files #2, Yellow 10, by Jerry Crandall. Messerschmitt Me-109 G-10/ U4 wk. nr. 610937. Civil registration: N109EV. Built in the summer of 1944 as a G-14 wk. nr. 127914, it was later rebuilt as a G-10/ U4 Jabo Rei (long range fighter-bomber) by WNF. Abandoned at Zeltweg Airfield in Austria at the end of the war. Its original identity will probably never be known. It could have been from a Luftwaffe unit or just as likely a Hungarian one as both countries were using this airfield at the time. Somewhere between May and August 1945, 610937 and many other aircraft were taken as trophies by units from the 6th Polk, (regiment) of the Bulgarian Air Force and ferried to Bulgaria. The trip must have been a harrowing one to say the least. The airfield was situated between the British and Soviet zones of occupation and the aircraft had to fly through the British zone. The English reacted by sending a protest to the Soviet Command to �stop flying German planes in their zone.� Two Spitfires were dispatched to patrol the area and anti-aircraft units occasionally opened fire on these �trophies� with at least three of them reported to have been shot down. The next stop was Pech Airfield in Hungary, where the Hungarians rushed the field thinking that they were welcoming their pilots returning home. They had a rather unpleasant surprise seeing that the aircraft were piloted by the Bulgarians. After a stop in Belgrade, they finally reached Sophia. Not much is known about the service history of these Bulgarian Me-109s. Many were transferred from the Karlovo Airfield to the Burshen Airfield near Silven and were actively flown by the 2nd and 3rd Orlyak (group) of the 6th Polk until they converted to the Soviet built Yak-9. Some of these Me-109s served in the training role as late as 1950, with the last of them being cut into scrap metal in 1951. In 1947, the Paris Peace Treaty limited the size of Bulgaria�s Air Force and some of its excess aircraft were sent to Yugoslavia in military equipment trade negotiations between the two countries. 610937 became part of a shipment of 59 Me-109s of assorted variants to be traded for a number of fuselages and tail units of Il-2 Strumoviks. After being transported to Zagreb by rail, the aircraft were refurbished, repainted and 610937 became �White 44�, Yugoslav Air Force s/n 9644. White 44 was flown by either the 83rd or 172nd fighter wing based at Cerklje Airfield and may have been flown on patrol sorties along the Italian frontier during the confrontation between Yugoslavia and Italy over the free zone of Trieste. White 44�s last recorded flight was October 17, 1950. Total flight time in service: 35 hrs. 15 mins. The aircraft was placed in storage until 1953, when it was declared scrapped and donated to a technical school known as the Machine Facility in Belgrade. It was used as an instructional airframe until somewhere between 1977 and 1979 when it was transferred to the Yugoslav Aviation Museum in Belgrade. Apparently the museum didn�t have the funds to restore the airframe and in 1984, it was sold to Doug Arnold�s Warbirds of Great Britain Collection. Some restoration work may have been carried out, but as with 610824, is un-confirmed. In 1989, it was sold along with 610824, to Evergreen Ventures and in 1991 it was sent to Vintage Aircraft Restorations LTD. at Ft. Collins, Colorado where after 5 years it was restored to flight-worthy condition. It was painted to represent an aircraft flown by Germany�s leading ace, Eric Hartman and is on display in preserved condition (fluids drained) at the Captain Michael King Smith Evergreen Aviation Educational Institute in McMinnville, Oregon. Data plates found with the two Me-109s. The top two plates show that wk. nr. 610937 was originally a G-14, wk. nr. 127914. Monogram Close-Up # 7, Gustav, Me-109G part II. An engine shot of 610937 showing the DB 605D engine and redesigned engine bearer. The other trademarks of the G-10 mentioned in the previous photo show up well here. Also of note are the two data plates just underneath the cockpit canopy, a sign that this a remanufactured aircraft. A painting of what 610937 may have looked like when it was in service with the Yugoslav AF as �White 44�, s/n 9644. Theodor Muchowski for his marvelous history of the Me-109G in Bulgaria. Tracy Buckley, Curator of the Evergreen Museum, for putting up with my endless questions. E-mail correspondence from authors Jerry Crandall and Peter Cohauz. Brian Nicklas of NASM and Doug Lantry of USAFM.